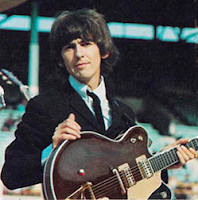 As the Beatles rose toward stardom, George Harrison purchased a 1962 Chet Atkins "Country Gentleman" Gretsch guitar featuring Gretsch Filtertron pickups, dual rocker action flip up mutes, a padded back, gold plating on all metal parts, and Grover Imperial tuners. This was George's guitar of choice throughout 1963 and 1964. Unfortunately, George's Country Gentleman was destroyed when it fell off the back of a limousine driven by the Beatles' driver, Alf Bicknell. George replaced his Gent with yet another Gretsch Chet Atkins model, the Tennessean. The Tennessean is considerably smaller than the Gent, and also featured painted "f" holes. George can be seen playing this guitar during The Beatles second US tour, including the first Shea stadium concert in 1965.